Lemon GreenTea: Goldilocks brings Pistang Pinoy to your table! Goldilocks brings Pistang Pinoy to your table! It is the merry month of fiesta, another Filipino tradition worth waiting for. Where there are more families and friends getting together to reconnect and strengthen bonds through food. Where you could eat your favorite dishes all in one seating! What is your favorite filipino fiesta food? Mine is kare-kare, mechado and Pancit! The Filipino culture is steeped in a rich tradition of festivities and celebrations, with almost every town and city holding a commemorative occasion. In Lucban, Quezon, the annual Pahiyas Festival has become widely known as one of the most colorful and vibrant celebrations in the country, attracting both locals and tourists alike. In true Pinoy fashion, merriment is always accompanied by good food, and signature dishes such as Pansit Habhab, Broas, Kiping, and the ubiquitous Lukban Longganisa have made the Pahiyas an even greater delight for those who attend. 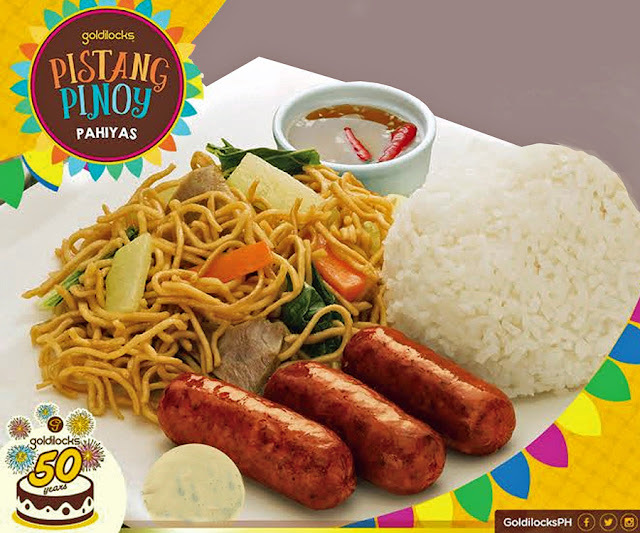 Throughout the month of May, Goldilocks Foodshop – through its Goldilocks Pistang Pinoy offerings – captures the culinary essence of Pahiyas through its new Pancit Habhab with Lucban Longganisa combo meal. Tasty noodles, fresh vegetables, and the juiciest pork links makes this dish the pride of Quezon.